"Ceci n'est pas une pipe." Yes, it's not a pipe, it's a poster. By Réne Magritte (1898-1967), known for his excursions into surrealism and "the treachery of images," his 1929 masterpiece, Ceci n'est pas une pipe, an icon of modernism and one of the most recognizable works of art of all time. But before his explorations of the landscape of the mind, he worked as a commercial graphic designer, creating, for example, over forty covers for sheet music during the 1920s in the Art Deco manner. And, as above, posters, this one, created later in his career for the Film and Fine Arts World Festival in Brussels 1947, integrating surrealistic mind play into the composition. Here, a woman is in the foreground to a movie screen, her forehead itself a screen: men project upon a woman a narrative they imagine, which may or may not reflect the reality of the woman's inner life and desires. Magritte spent a large part of his life working in advertising, both to help sustain himself during lean times, and out of an interest in publicity. 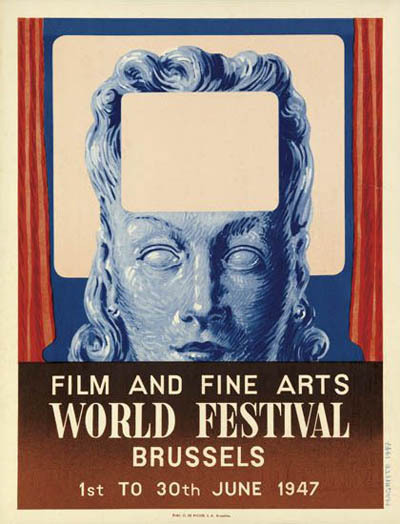 He re-used the above image in 1949 for the second of these film festivals. This is the scarce smaller format. These examples of Magritte's graphic work were part of Swann Galleries' Modernist Posters sale held this past Monday, May 12th. 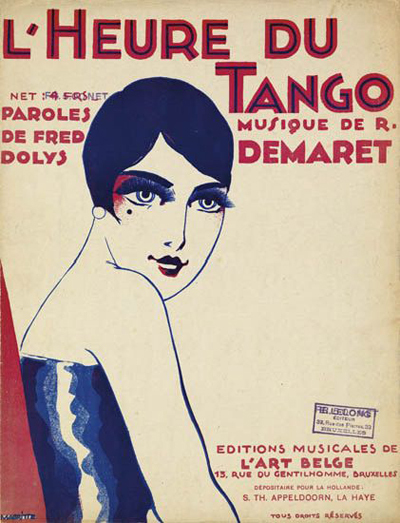 Magritte designed the cover of the sheet music to L'Heure du Tango in 1925 for Brussels publisher L'Art Belge. 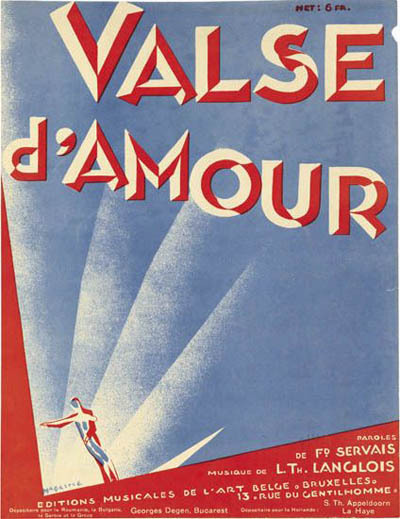 The sheet music for Valse d'Amour, with it cover by Magritte, was published in 1926 by L'Art Belge. 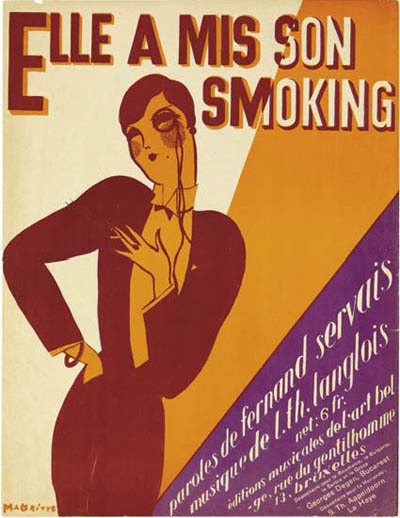 Elle A Mis Son Smoking was also published 1926, it, too, issued by L'Art Belge. Magritte's earliest oil paintings, dating c. 1915, were Impressionistic in style. His oil paintings 1918-1924 were influenced by Futurism and by the offshoot of Cubism practiced by Metzinger. Female nudes dominate this period in his work. Magritte worked as a draughtsman in a wallpaper factory 1922-1923, and was a poster and advertisement designer until 1926, when a contract with Galerie la Centaure in Brussels made it possible for him to devote himself to painting full-time. Magritte produced his first surrealistic painting, Le jockey perdu, in 1926. It, and others by the artist, were exhibited in Brussels in 1927 but met with critical scorn. Depressed by their poor reception, Magritte moved to Paris where he became friends with Andre Breton and became involved in the surrealist group.